"Sleeping monsters lie" (sample) (June, 2010). On the album Corridor. This piece borrows a couple of licks from the melody of the song "Monsters Slapen Nooit" ("Monsters never sleep"), by the Dutch pop group Bløf. The picture is of an arch at the entrance to Max Euweplein (Max Euwe Square) in Amsterdam. (Euwe was a Dutch grandmaster, the fifth World Champion of chess). 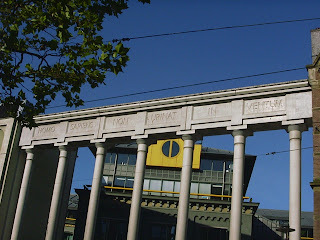 The inscription reads "HOMO SAPIENS NON URINAT IN VENTUM".